Audio Research DS 450. Solid State power amplifier. 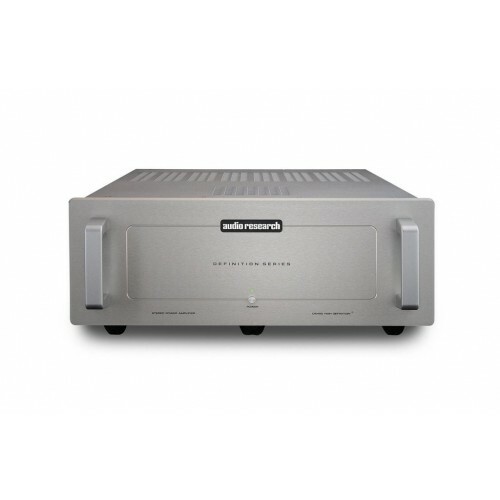 The DS450 stereo power amplifier is the second member of the "Definition Series" from Audio Research. With a muscular 450 WPC into 8 ohms and stunning sonic performance, the DS450 provides high performance, high efficiency and high value. Designed entirely in-house by our engineering staff, the DS450 is a balanced differential design with zero global feedback. Many proprietary parts are incorporated, including our own custom designed transformers that are manufactured in the US, our own litz internal wiring, and filters that we hand wind in house. In fact, it is not merely assembled here, every amplifier is entirely hand-made from the ground up in our Minnesota facility where it is tested, burned-in, and evaluated in a reference system before being shipped to its new home. The DS450 is a blend of two design approaches. The power supply is a classic linear, analog supply, heavily regulated and scaled up to provide explosive dynamics and impact. Its 1239 joules of energy storage are twice that found in the DSi200. Dynamic power is 900 watts into 8 ohms, 1800 into 4 ohms, and 2800 into 2 ohms, meaning the DS450 can control those big, tough-to-drive speaker systems. The output stage is a high-speed pulse-width modulated (analog) switching design that also builds on the proven formula in the DSi200, but with twice the number of 500W power-mosfet output devices in each channel. With a 400 kHz switching duty cycle, the output stage stays cool under the toughest loads. With approximately 93% power efficiency, the DS450 is "green" and has earned an ENERGY STAR certification. Want a high-power amp that you can safely store inside a cabinet without worrying about heat buildup? The DS450 is the answer. Because it idles at only 55 watts, the DS450 can be left on continuously for best performance. The DS450 retains the all-silver chassis of the Definition Series, and operation could not be simpler. In addition to the front panel power button, the DS450 has a 12V trigger so it can be powered-up remotely. With a fully balanced differential design, there are both balanced XLR and single-ended RCA input connectors. The rear panel contains dual Cardas® binding posts to provide a secure and easy way to attach heavy speaker lugs without using a wrench – and they sound great. A 12-gauge detachable power cord with a 20A IEC connector is standard. Sonically, the DS450 will really surprise you. Incredibly dynamic and quick on its feet, it has a big "jump factor." Bass is deep, harmonically rich, and forcefully controlled. The midrange is open, tightly focused and uncannily transparent. Highs are extended, detailed and grainless, and the DS450 has lower crosstalk, more air and even better soundstaging than its smaller sibling. You need to hear it for yourself to appreciate its remarkable musicality. The DS450 is a beguiling amplifier, combining the best attributes of transistors and tubes in a package that is easy to look at, to live with, and to love. Leave your preconceptions at the door and immerse yourself in the experience of great music. 450 watts into 8 ohms (550 watts per channel into 4 ohms), both channels driven, 1% THD. (700 watts into 4 ohms, one channel driven). (-3dB Points) 5Hz to 45 kHz into 8 ohms. 2.9V RMS for rated output. (26dB Gain) single-ended or balanced. Non-inverting. Balanced pin 2+ (IEC-268). 0.02dB 8 ohm load to open circuit (Damping factor 440). 100-125VAC 60Hz (200-250VAC 50 Hz) 950 watts at rated output (400WPC 8 ohms) 1300 watts at 500WPC 4 ohms, 1300 watts maximum. 55 watts idle. 19" (48 cm) W x 7" (17.8 cm) H x 18.4" (46.7 cm) D. Handles extend 1.5" (3.8 cm) forward. Output connectors extend 1.5"(3.8 cm) behind rear panel. 55.8 lbs. (25.4 kg) Net; 71 lbs. (32.3 kg) Shipping.